Phyllis R. Cottrell, age 85, of Joplin, passed away on Saturday December 22, 2018, at Mercy Hospital, following an illness. 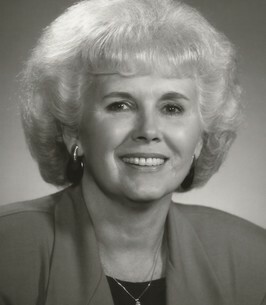 Phyllis was born on August 2, 1933 in Joplin, the daughter of the late Fred and Ruth (Brown) Lawson. She married Richard Cottrell on August 2, 1952, and together they raised two children. They met during her senior year at Pittsburg High School in Pittsburg, KS. Phyllis was working the ticket booth at the old Colonial Fox Theater in Pittsburg where she met Richard, who was a young theater manager just out of the U.S. Navy. Phyllis started a career with Southwestern Bell Telephone Company that lasted for decades, rising to Business Office Supervisor first in Joplin, then in Springfield. She was a member of the Southwestern Bell Telephone Pioneers. After her retirement, she and her husband were dedicated members of the St. John’s and Mercy Volunteer Auxiliary. With nearly 30 years of volunteer service, Phyllis was named the 2017 Missouri Hospital Association Volunteer of the Year for the entire state. She was preceded in death by her parents, her second son, David Wayne Cottrell in 1954, then by her husband, Richard Cottrell in 2003; one brother, James Lawson; and one sister, Barbara Williams. Phyllis is survived by; one son, Steve Cottrell and wife Rhonda, Carthage, MO; one daughter, Cathy Cody, Joplin; four grandchildren, Grant Cottrell and wife Janell; Nicholas Cody and fiancé Priscilla Paoli, Kyle Cody, Tyler Cody; and two great-grandchildren, Cohen Cottrell and Merrick Cottrell. Funeral services will be 2:00 p.m. Thursday at Mason-Woodard Chapel. Burial will be in Ozark Park Memorial Cemetery. The family will receive friends at 1:00 p.m. Thursday prior to service time.